The results speak for themselves really, whilst not outstanding, they are very solid indeed. This PSU feels like one of those quiet children at school, that does the work, but doesn't really get noticed. It easily completed all the tests, and passed with flying colours right up to its 500w limit. The modular cables and large fan mean that not only the PSU runs cool, but it also improves airflow within the case. The design of the unit is also worthy of note, with its nice paint job and electroplated grill featuring the OCZ logo. The only worry we had about the ModXstream 500w was the use of a fairly low spec capacitor. However, having thoroughly tested the unit, we can safely say it doesn't seem to affect the units performance in any way. Availability isn't great at the moment, with Specialtech being the cheapest UK supplier. Priced at £49.42, the PSU suddenly stands out from the crowd. It fits into the cheaper end of the 500w scale, yet is extremely quiet, modular and stable. Therefore, we can whole heartedly recommend this PSU, which is simply perfect for all but the most advanced gaming rigs. * Efficiency is mediocre at 100% load. 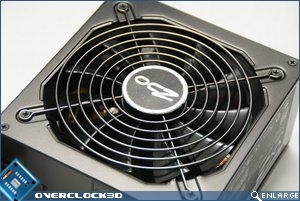 Overclock3D would like to thank OCZ for supplying todays review sample. Discuss this review in our forums. first, thanks for the review Jim, and now, coments: it looks pretty good for a 500w psu, the temps of it aren't bad, it does it job well, its silent, and isnt expensive at all, maybe this is another one for me to chose? im still having trouble at choosing 500w modular psu's. i think i still have the corsair as my top. Nice review It's certainly interesting to see another of the OCZ lower budget series, the StealthXstream were already very interesting. I don't think it can compete with the cooler master m520 when it's about price though. The ModXstream retails for €65.- in the Netherlands while me m520 is about €7-8 cheaper. May not sound like a lot but most of the time these psu's are used in low budget builds where every penny counts. These roundups do not neccessarily have to be a seperately written article but could also be a summary of all reviews maybe in the form of a table.